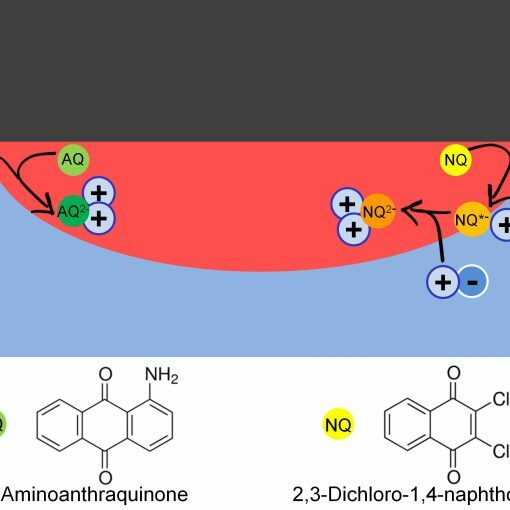 We just had a paper published in Analytical Chemistry concerning generation-collection electrochemistry inside a rotating droplet. 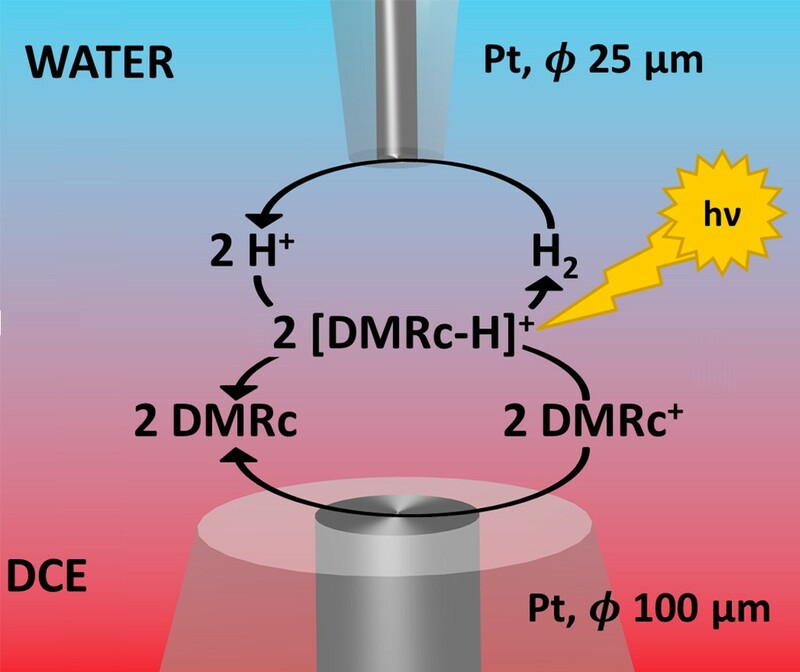 This is a continuation of the investigation of the rotating droplet as a small volume hydrodynamic system that was published last year in Electrochem. Commun. 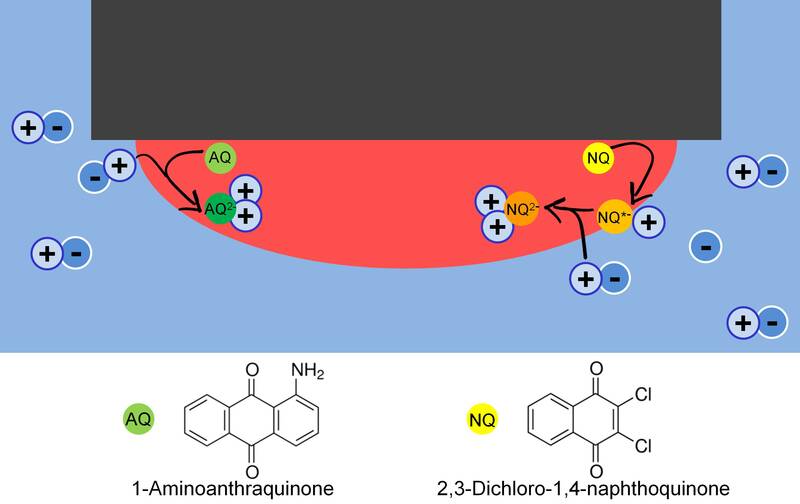 In this paper we generation-collection electrochemistry, meaning that we have two working electrodes in the system. On one, called the generator, a reversible redox probe is oxidised (or reduced), and the product is collected on the second working electrode called the collector. The typical example of such systems is the rotating ring disc electrode, were the product created at the disc is collected on the ring. Here we show that we can make a generation-collection system by cutting electrodes in ITO and using them as base for the rotating droplet. The electrodes were cut using femtosecond laser ablation by Michał Nejbauer, who is a co-author from the laser centre at our institute. But functional electrodes, for qualitative measurements can be easily made by just scratching the ITO with a glass cutter. 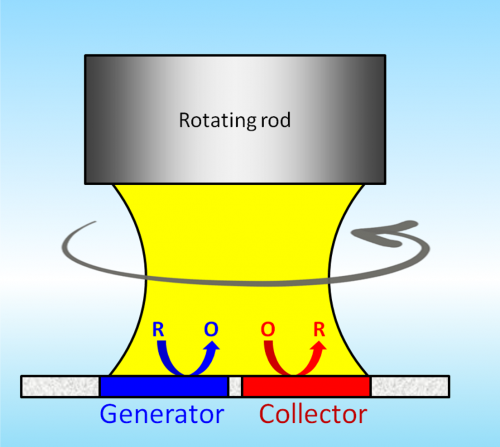 The rotating droplet gen-coll system functions similarly to the RRDE but with higher collection efficiency due to the small distance between the generator and the collector. The behaviour at different rotation rates differ from the RRDE, but is probably due to the specific motion of flow inside the droplet. That is something we will investigate further using a combination of simulations and flow measurements. We also show that because of the small volume of the system, the generation-collection can be used to deplete irreversibly oxidisable interferents when measuring a reversibly oxidisable analyte. We exemplify this by measuring epinephrine (adrenalin) in presence of large concentrations of uric and ascorbic acids. The paper is freely available here or directly directly here as a pdf.